Join us as we raise money for WNY Heroes!!! 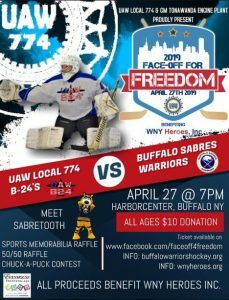 Exciting Ice hockey, and an amazing sports memorabilia and basket raffle with many autographed items from your favorite Sabres and Bills Players. Plus, a 50/50 raffle, Chuck - a - puck contest and you can also meet Sabretooth!!! !